I don’t think anything has excited me this much since I completed the Music City Half Marathon. You will probably yawn and think “What’s the big deal?” If so, you probably have a cleaning service to clean up after you. I don’t, and one of the most offensive areas in my home is my refrigerator. I try to clean it out once a month. I take out all the drawers and scour, scrub and pry loose all these alien substances that grow on the shelves. It’s my most dreaded chore. This week I had a brilliant idea and for once I followed through with good results – unlike the time I collected pizza boxes to line my flower beds. I covered them with mulch thinking no self respecting weed would dare invade. What I didn’t think about was all the raccoons which had a field day digging up the greasy boxes,. eating them, and scattering my mulch over a three block area. I went to the Dollar Tree and bought some cheap placemats and plastic baskets. The mats fit perfectly in my GE Profile side by side fridge. The baskets (3 for $1) were perfect for stacking bags of cheese upright or stashing sticks of butter etc. My local store also sells a mesh thingy with which you can line your crisper drawers. It works great so far wicking moisture away from what you can’t consume right away. I cleaned out the the entire fridge – hopefully for the last time – throwing away everything older than my car (it’s a 2001). I installed the place mats and was so pleased with the results I invited the neighbors in for an “Open Refrigerator “(you know – like an open house?) Now, when the gunk returns, I only need to take out the mat, rinse it off and I’m good to go. No need to thank me for this fabulous tip. I take payment in tomatoes. And by the way, would the kind person who left three bags of fresh vegetables on my back porch on Sunday please let me know who you are so I can thank you properly. I’m in tomato hog heaven. 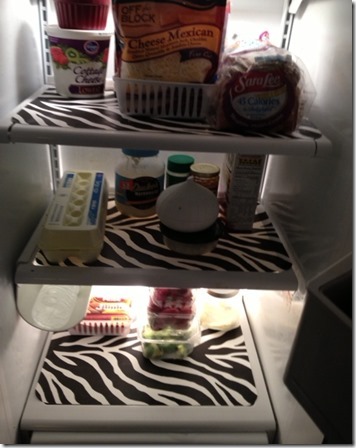 This entry was posted in Good housekeeping and tagged Brilliant fridge idea, Ideas from Dollar Tree, Keep your refrigerator clean with one simple step by Emily Jones. Bookmark the permalink. 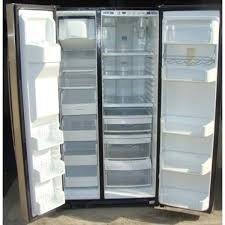 This my friend is a fridge with style! I will trade you tomatoes for a good fridge cleaning. 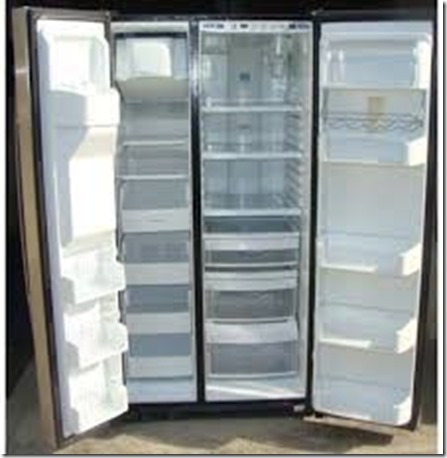 What a chic refrigerator!! I love it! What a great idea! I will be shopping for placemats, etc.